You're wearing a set of awesome, bright blue Cookie Monster scrubs. You're in a crowd of other nursing students. They're wearing grey. You stand out like a firework. That's what we need your nursing student resume to do. We can't print it on Cookie Monster paper. The hospital's HR director wouldn't like it. Instead, you'll need a professional new grad nursing resume that gets attention. A nursing student resume example better than 9 out of 10 other resumes. How to write a nursing student resume that will land you more interviews. Tips and examples of how to put skills and achievements on a nursing student resume. How to describe your experience on a resume for a nursing student to get any job you want. Here's a sample resume for a nursing student made using our resume builder. Nursing Student Resume Example - See 20+ resume templates and create your resume here. What's the Best Format for a Nursing Student Resume? Meet the hospital's HR director, Tracie. Why is she so frazzled? It's because her scuffed old laptop holds 300 nursing student resumes, and she's got to read them all. She only spends six seconds looking at each one. That means the format for your new grad RN resume really matters. 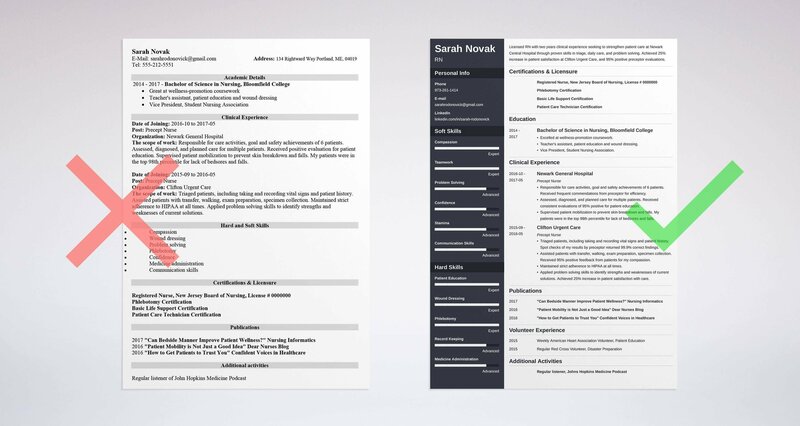 The reverse-chronological resume layout is the best format for a nursing student resume. That's because it shows your best stuff, stat. Then Tracie can dig into the details once she's got the gems. Use neat, distinct headings and clear, legible fonts. No comic sans. Use white space to avoid that "epidemic of words" feeling. Finally, save your new grad nursing resume in the PDF format. That'll keep the layout from going into critical condition later. Pro Tip: PDFs are generally best, but check the job description to make sure they're OK. Some Applicant Tracking Systems don't play well with new grad RN resumes saved as PDFs. Want to explore other options for your nursing student resume format? Trying to learn how to write a resume for the first time? See this guide: "3 Resume Formats: How to Choose the Best One [Examples]"
You want the HR manager to say the words above when she sees your new grad RN resume. You can make that happen with a solid resume objective or resume summary. A resume summary is for nursing students with truckloads of experience. A resume objective is for those with fresh diploma ink. Either one needs measurable achievements. These two nursing student resume examples show what I mean. Nursing school graduate looking for a job at a major hospital. Compassionate and skilled in patient care. I'm good with people and have problem solving skills. Not bad, but neither are the other 299 new grad nurse resumes on Tracie's laptop. Licensed RN with two years clinical experience seeking to strengthen patient care at Newark Central Hospital through proven skills in triage, daily care, and problem solving. Achieved 25% increase in patient satisfaction at Clifton Urgent Care, and 95% positive preceptor evaluations. Bam. That's an adrenaline shot right to the hiring manager's heart. Don't have that kind of experience? In that case, look at the two new graduate nurse resume examples below. If you're still a student nurse and you haven't completed your degree, don't fret. You can still prove that you're perfect for the job. A student nurse resume objective works for entry level nursing job applicants, interns, or anybody seeking a new niche. New nursing student looking for an internship. Not much experience yet but I'm eager to learn! That misses the mark like a dull needle on a rolling vein. Hard-working student nurse with one semester of clinical experience. Proven skills in triaging patients, taking vital signs, and assisting with patient mobility. Received 96% positive marks from preceptor and 95% positive patient feedback. Remember Tracie? Our hospital HR person? She's looking for proof you can do the job well. The nursing student resume example above gives her that proof. Pro Tip: Your new grad RN resume objective or resume summary is the finishing touch on your nursing student resume. Write it last, once everything else is done. The hiring manager has 97 things to do before lunch. She won't waste time on new grad RN resumes that make her hunt for licenses and certifications. Then add it at the start of your nursing student resume summary. Finally, put it in a separate section for licenses and certifications, right under your experience section. Why put your certification above your education? It's recommended for doctors, and what makes sense for doctors makes sense for nursing students. Is putting your RN license on your nursing student resume three times an overdose? No. It respects the HR manager's time by helping her find what she's looking for, fast. Pro Tip: Many nursing students fear putting license numbers on a new grad nursing resume. They think it aids identity theft. However, most states publish nursing licenses publicly online. Want more help writing the best nursing student resume you can? See this guide: "Complete Guide to Writing a Student Resume [13 Tips, Examples]"
For a nursing student, education is everything. Remember Tracie, our hospital HR manager? She'll spend the most time looking at your new grad nursing resume's education section. Make sure to make it stand out like a light bar on an ambulance. Then add relevant coursework in a way that fits the job description. Here are two entry level nursing resume examples. They both target a job opening that values wellness promotion, patient education, wound dressing, and leadership. Teacher's assistant, patient education and wound dressing. Vice President, Student Nursing Association. Two semesters of clinical experience and nursing internship positions. That's not a nursing student job applicant. It's Katy Perry in scrubs. It fits the job description like a pair of custom Dansko Mules. Now look at the second of our new graduate nurse resume examples. It shows what happens when we lose the details. Took anatomy, microbiology, chemistry, and nutrition classes. That's as bland as coffee with no coffee in it. Every nurse takes those classes, and every licensed RN has to pass the NCLEX exam. But add the details, and you're back off life support. Pro Tip: You don't have to make up anything. Just look at the job offer, then think about the things you've done in school that prove you've got the chops. To make your new grad RN resume pop out like a hazmat label, see our guide: "How to Put Your Education on a Resume [Tips & Examples]"
Wonder Woman has a magic lasso and bracelets that deflect bullets. When it comes to new grad nurse resumes, you have a magic weapon, too. It's internships, clinical experience, and volunteer experience. All of these look great on a nursing student resume. Most nursing students graduate with plenty. Responsible for care activities, goal and safety achievements of 6 patients. Received frequent commendations from the preceptor for efficiency. Assessed, diagnosed, and planned care for multiple patients. Received consistent evaluations of 95% positive for patient education. Supervised patient mobilization to prevent skin breakdown and falls. My patients were in the top 98th percentile for lack of bedsores and falls. The HR manager just used her thumb to check her pulse. Your top-notch entry level nursing resume just blew her mind. Responsible for care activities for multiple patients. Assessed, diagnosed, and planned patient care. No details. Like a SOAP Notes form that hasn't been filled out yet. You must add details to get that HR manager to notice you. But what if you don't have details? In that case, see the next two nursing student resume examples. In the nursing world, there's no such thing as no experience. That's because nursing programs offer clinical components. But all student nurse resumes show this clinical experience. So you need to make yours stand out like a surgeon's signature on a pre-op body part. I'll show you how in the two nursing student resumes below. Student Nurse Experience: I've had one semester of clinical experience so far. See the problem? It's as generic as a carton of atorvastatin. Triaged patients, including taking and recording vital signs and patient history. Spot checks of my results by preceptor returned 99.9% correct findings. Assisted patients with transfer, walking, exam preparation, specimen collection. Received 95% positive feedback from patients for my compassion. Maintained strict adherence to HIPAA at all times. Applied problem solving skills to identify strengths and weaknesses of current solutions. Achieved 25% increase in patient satisfaction with care. Now you're A&Ox3. But with a little effort, even someone who hasn't graduated yet can have a nursing student resume like that. Pro Tip: Even a single semester of clinical experience can beef up your student nurse resume experience section. Dig deep to find achievements in each position. Don't lull that HR manager to sleep with boring language in your student RN resume. Grab her attention with action words instead. See our guide: "+80 Examples of Resume Action Words for Every Profession"
We'll sneak into the hiring manager's office as she reads her stack of resumes. She's muttering and she does not look happy. That's because her stack of 300 nursing student resumes all have the same skills list. Worse, not one candidate proves she has those skills. Then the hiring manager sees your resume. The scowl fades like a bad rash after a shot of hydrocortisone. You did it by picking the right skills resume keywords to get past her applicant tracking system. Patient care, patient education, compassion, teamwork. Patient care, patient education, wound dressing, compassion, teamwork, stamina. Responsible for patient care for four patients. Regularly performed patient education in advance of procedures and treatments. Received 96% positive comments from patients for my compassion. Given a letter of commendation from my preceptor for teamwork skills. See how you linked the skills to your experience? Now do that with your entry level nurse resume. You can use the skills below. Let's give you a nice jump start. Use these new grad nursing resume skills. Then look at some real nursing student job descriptions online to get more skills for your list. If you follow the advice above, your student nurse resume will make you look like Clara Barton or Nurse Katz. Remember to use the skills mentioned in the job posting. This way you will gain advantage over other candidates especially in the context of a large skills gap in the healthcare sector. Pro Tip: Only list the skills you really have on your new grad nursing resume to keep from getting tripped up in the interview. Need to give your nursing student resume skills a shot of epinephrine? See our guide: "+30 Best Examples of What Skills to Put on a Resume (Proven Tips)"
Jobs for nursing students are growing really, really fast. The competition is growing even faster. It's like a big bowl of delicious cookies that's getting bigger all the time. But more people keep coming in to eat the cookies. Make sure you get your cookie. By using "other" sections to make your new grad nurse resume glow like you dipped it in barium. The first of these two new grad RN resumes will fail. I enjoy driving my motorcycle. I like taking long walks on the beach. What's wrong with tattoos, motorcycles, and walking on the beach? But they don't prove you fit the job description. 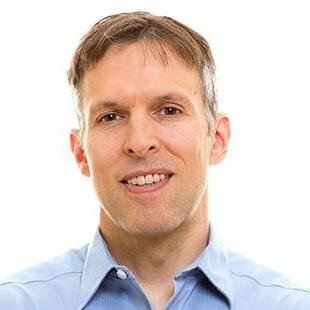 Regular listener, Johns Hopkins Medicine Podcast. Take weekly yoga classes to stay in shape. The publications and volunteer experience show you're not just in it for the paycheck. They show you actually care. The additional activities prove you are a rounded person. With a little thought, any student nurse can build a resume example like that. Pro Tip: Consider joining the American Nurses Association. Not only does it look great on an entry level nurse resume, but it opens up dozens of great networking opportunities. Don't want to add an activities section to your new grad RN resume? Consider a hobbies section. Nobody does it, but it works so well. See this guide: "+20 Best Examples of Hobbies & Interests To Put on a Resume (5 Tips)"
Right. And "Just the other day a student nurse fed Maalox through an IV line." The truth is, 60% of hiring managers don't read cover letters. You have to write a nursing student cover letter for the other 40%. If you know the HR manager's name, use it. Connect your skills directly to the job description. Do that by mentioning some details from the job offer. Then list one or two achievements that show you're Carla Espinosa in disguise. Basically, it's, "You need XYZ. I have XYZ. Here's proof." But a lot shorter than a nursing student resume. Close it with a call to action. Use a simple statement like, "I'd welcome the chance to talk with you about your needs." Pro Tip: After you send your student nurse resume and cover letter, make sure to follow up. A phone call or an email in a few days can put you top-of-mind. Need a more concrete example for your nursing student cover letter? Check out our guide: "How To Write A Cover Letter [Complete Guide With Examples]"
You made a rookie mistake. You botched the contact info on your student nurse resume. Now the hiring manager has crossed you off the list. Then add your LinkedIn profile, your Twitter handle, and other relevant connections. Your LinkedIn profile is as important as an open airway. Make it sing with our guide to LinkedIn profile fixes here. Pro Tip: One embarrassing Facebook pic can put your job search into cardiac arrest. Don't let that happen. See our guide to cleaning up your online presence here. Want more tips to make the best nursing student resume you can? See our guide here: "How to Make a Resume: A Step-by-Step Guide (+30 Examples)"
For an entry level nursing student resume or CNA resume with no experience, focus on your licensure and clinical experience. Tie your education section and experience to the job description. Make sure every section of your new graduate nursing resume proves you have what the recruiter wants. Whether you're making an entry level LPN resume or a new RN resume, be sure your license info figures prominently. Never forget to include a nursing student cover letter in your job application. Got questions or tips about how to make a professional graduate nurse resume? Give us a shout in the comments section!